Maximum length: 18m (59ft), average 12.9 m (42ft) males, 13.7 m (45ft) females. 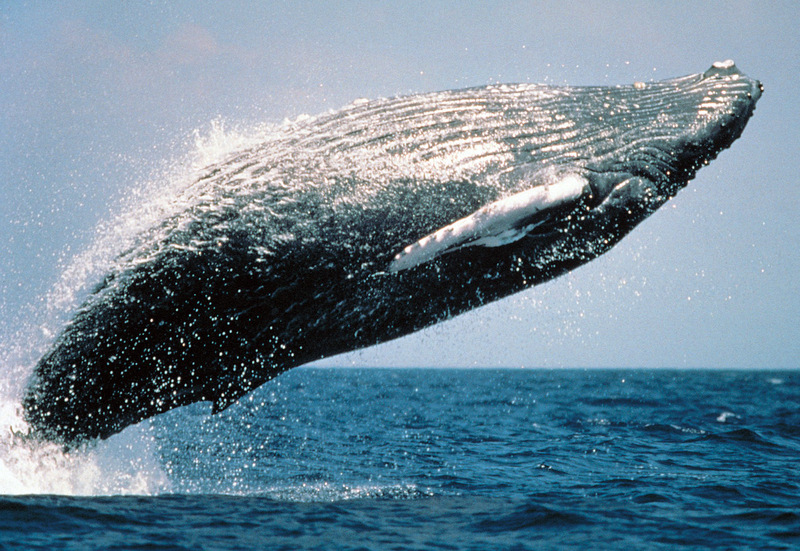 Adult weight: around 25 - 35 tonnes, maximum of around 48 tonnes. 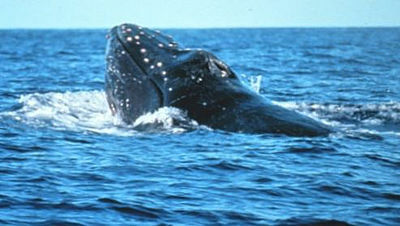 Distribution: all oceans, Humpbacks don't appear to cross the equator so populations separated. They have relatively the longest flippers of any baleen whale which may be up to a third of the total body length, these have a range of uses from feeding to social signaling. Humpbacks are probably the best known and most recognisable of the large whales as they often collect in groups along coasts where they feed and breed, drawing attention to themselves by their behavior. Breaching, lob tailing and flipper-slap are common and often occur several times in a row. 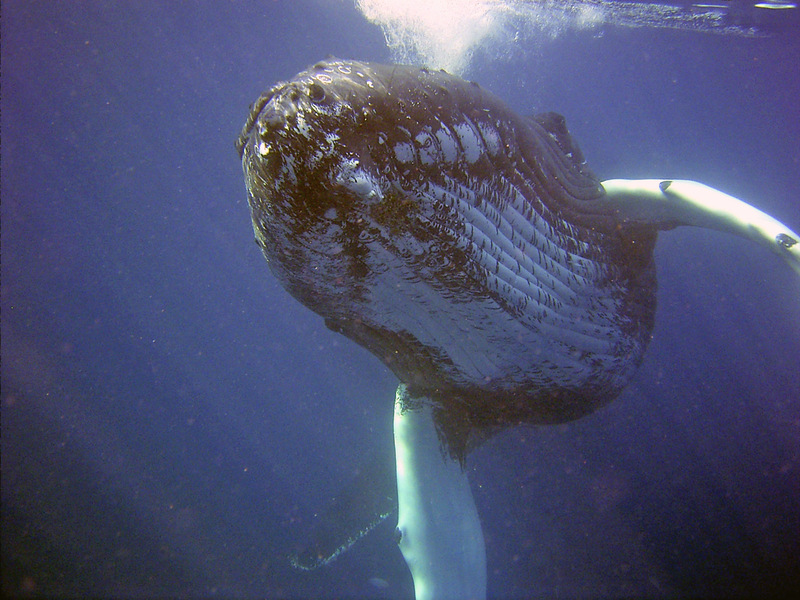 The skin is covered with a whole range of warts and bumps and there is a particularly rich fauna of barnacles that encrust the whale (there are whole groups of "whale barnacles" types that are found nowhere else but on whales). 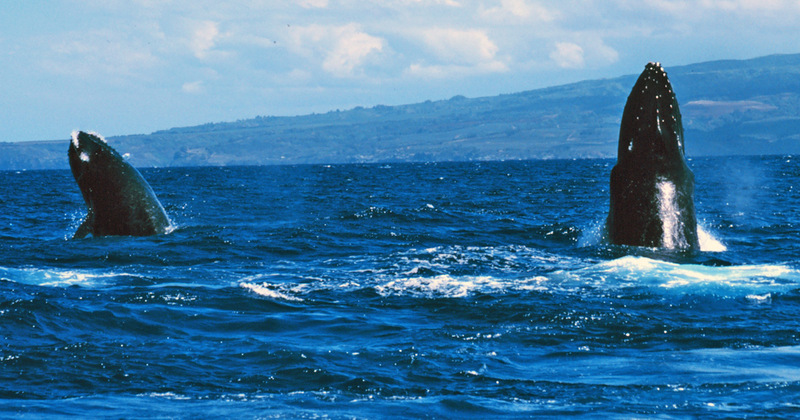 The bushy "blow" of a humpback whale from the double blowhole is quite characteristic, even at a distance. 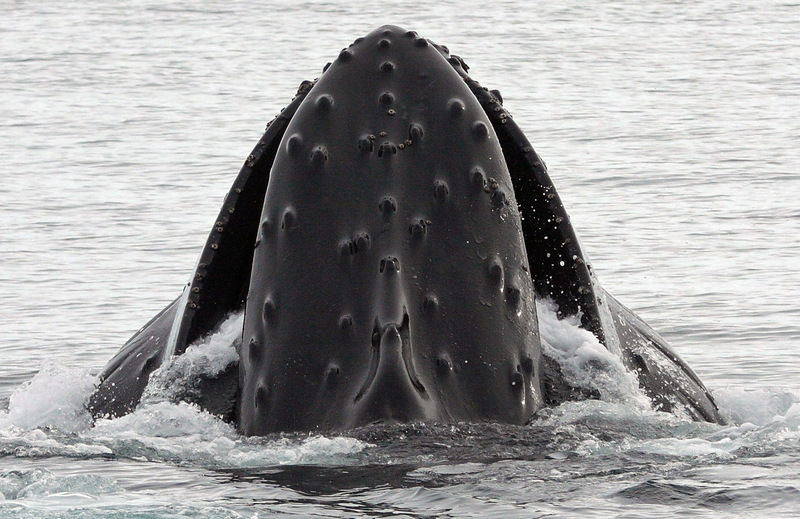 Leading edge tubercles - the long flippers of humpback whales are very bumpy with forwards pointing protuberances called tubercles rather than having a smooth leading edge that you might expect them to have. Experimentation has show that these enable them to be very agile underwater, especially when swimming in the tight circles needed when bubble netting. These increase the efficiency of the flippers to such an extent that they are being investigated to see if the idea can be applied to devices such as wind turbines. 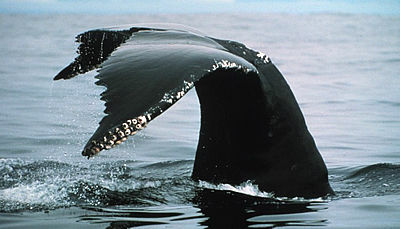 Humpback whales have very distinctive markings on their tail flukes, they also have a particular diving technique where their tail emerges from the water before a dive, being flipped to vertical before slowly sliding beneath the surface. 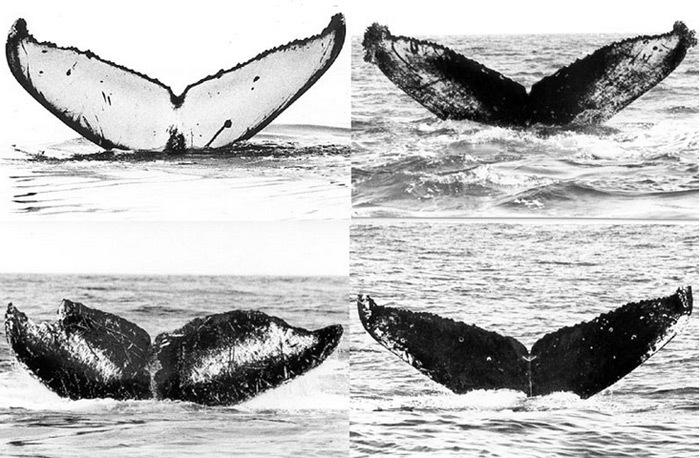 In this way the tail pattern is clearly exposed and can be used by whale researchers to identify individual whales. 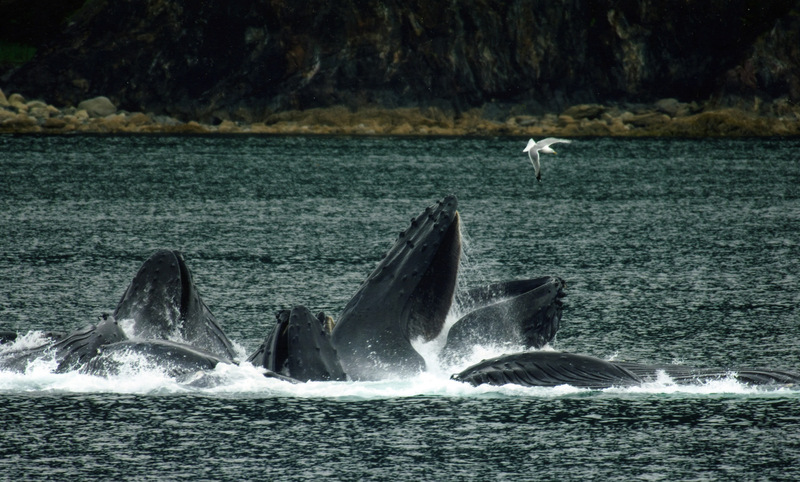 Like other baleen whales, the food of humpbacks is small plentifully abundant schooling fishes and large zooplankton. The precise diet is certainly different for different populations as the prey animal distribution shows, though it has not been studied in any detail for the majority. In Antarctica, the diet is dominated by krill (like almost every other mammal in Antarctica). In other seas, the diet may include anchovies, mackerel, sand eels, herring, capelin, pollock and cod. Disabling fish by striking shoals of them with their flippers or flukes. 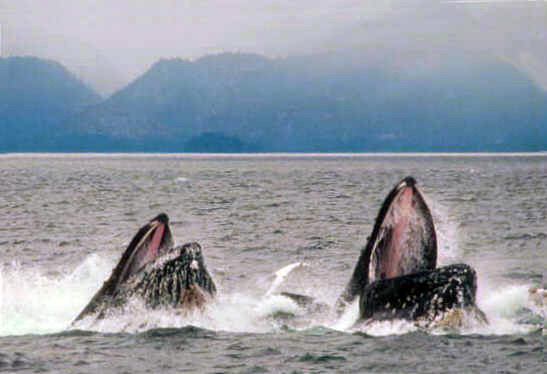 Synchronized lunges at shoals of fish or invertebrates by a number of whales side by side. This disorients the prey and while they dash out of the way of one whale, they may swim directly into the path of another. Co-ordinated feeding and herding of prey species including "bubble netting". This is a particularly impressive technique where one or two whales dive down below a shoal or swarm of prey and then swim back slowly toward the surface in a spiral. As they swim they slowly blow bubbles which arise in a circle and drive the prey in a panic towards the centre of the circle. The whale/s then thunder straight up through the middle with their mouths open and get a more concentrated mouthful of food. 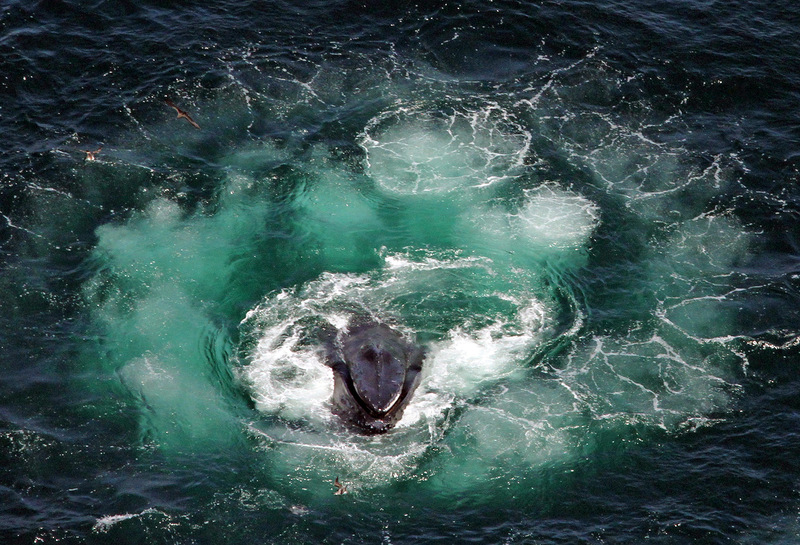 The picture to the right is of a rising spiral of bubbles blown by a humpback whale deep beneath the surface while swimming in a circle. As well as cooperative behavior, competition has been seen between animals feeding together in large fish or plankton concentrations. The whales have been observed rushing to the surface together while pushing and shoving each other with mouths full and throats distended. 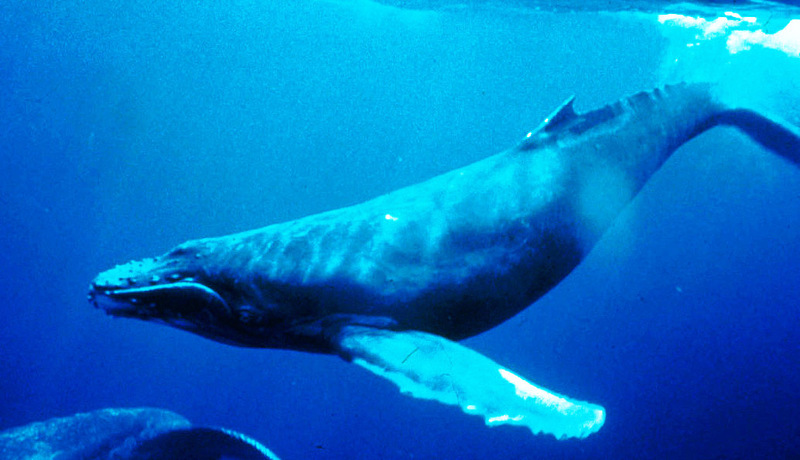 Humpbacks feed mainly during the summer season in high latitudes in the Arctic or Antarctic and do not feed during the winter while on the breeding grounds. Social behavior - Humpback whales are usually seen alone or with one other whale, they may form small groups of 4 or 5 individuals, very rarely larger. These groups are loose and unstable and are made and break up easily. They used to be thought to be made up of family groups or mating pairs, though this is now thought to be unlikely. 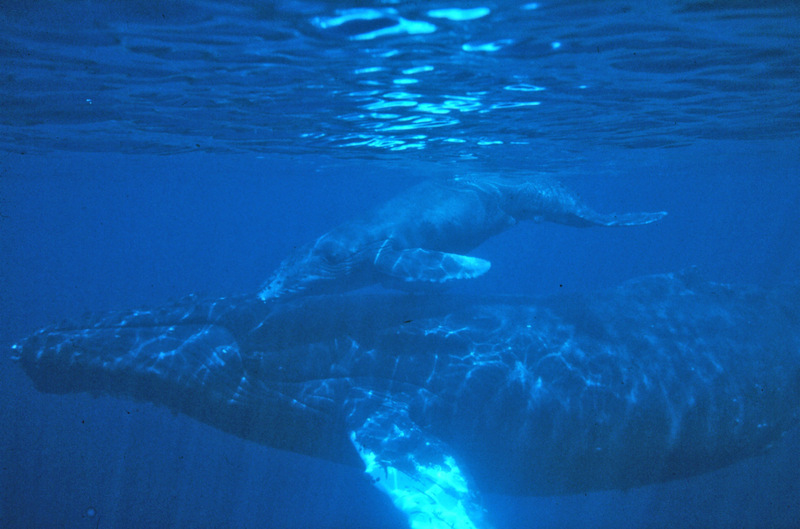 The only long-term grouping of any sort is between mother and calf, though sometimes a male may accompany them and become aggressive to any other male approaching, probably a result of having mated with the female and not wanting any other male to mate with the female (the whales don't "know" this of course, it's all instinctive).